True stories about my life, the active life. Growing up in Loveland Colorado, attending the University of Colorado in Boulder, Working for Outward Bound in Bermuda, Traveling Europe, Moving to California and learning to surf... The stories will all be here. This quiet corner of Estes Park Colorado was once home to a fully functioning ski area! What I know about its history comes mostly from family members who grew up skiing in Colorado. Apparently there used to be two main lifts and four or five good runs (very small compared to the current resorts in Colorado like Vail or Breckenridge). After years of operation the contract between the forest service and the resort was ended. This due in part to declines in profitability and lack of snow the resort was receiving. The lifts were taken out (these were the type of lifts that were ground based where you held on to a rod and got pulled up on your skis) and the downhill skiing stopped. 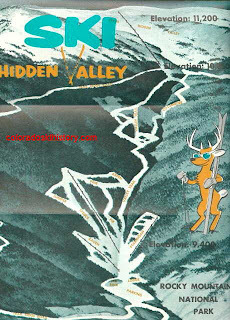 Here is some more background and history for Hidden Valley. Eventually the trees began growing back and the lodge was partially torn down. Today it is harder to tell that a ski area once existed there but the large white tracks from runs are still evident on the inner parts of the valley and telemark skiers and snowshoers do still visit during the winter months. For me and my snowboarding crew “The Ruff Riders” (named after the rap group) Hidden Valley was the perfect spot to learn new tricks, build interesting jumps or “hits” as we called them, and just take a break and get away from it all. We could do whatever we wanted in those mountains and since the trees were partially cleared from the old days of when it was a true ski area, it was the perfect place to go! I remember pestering my Mom and Dad (or one of my friends parents) to take us up nearly every weekend (sometimes twice!). Once we finally started turning 16 and getting cars we would ditch school, and all pile in to do some backcountry boarding when the snow was good. Driving up the narrow canyon road singing along to DMX with Jeff Niccum… It was a blast! We all had snow shoes, and I had a couple of extras for different friends to come along if they wanted, we would put on special board holding backpacks full of power bars, fruit, and water in camel back pouches and then make the painful hike at high altitude up to the top of Hidden Valley which would usually take 2+ hours! Once we got to a good spot above tree line where it thinned out a bit, we would start digging and building hits. The whole process took over two hours before we would even put our boards on. We really wanted to get a snow mobile or something but since it was a national park that just wasn’t allowed. As seen in the video, we had hips, rails, and even a road gap! The rail wasn’t a feature that came with Hidden Valley, we had to stash it there and the idea came when we first saw it being used as a crowd control barrier at a concert in Fort Collins. A few of the Ruff Riders commandeered the rail one night after the concert and put it in the back of Mike N’s truck. It was then given to me and I took it up to a spot just off of Trail Ridge Road with a good friend named Zach. We pulled over on Rainbow Curve and quickly carried it off into the trees where it remained all summer until we uncovered it during the winter when it began to snow again. The rail is pretty weak by today’s standards but back then in 2000, it was pretty awesome. The road gap came about when we decided to hike on Trail Ridge Road road to get above tree line in Hidden Valley instead of walking up with our snowshoes. It just so happened that there was a plow on the road that day and he saw us and we convinced him to give us a ride to the Rainbow Curve section of road. Just as we came around the corner the first thing I thought was… road gap… and I said it out loud without even thinking. I had never before seen the road plowed like this during the winter and suddenly, what used to be a patch of flat snow was the potential for the coolest trick any of us had ever done – gapping the road on our snowboard. The plow let us off and we started tossing the idea around. Eventually we started building and once it was done we were all so afraid of the possibility of actually doing it that nobody wanted to try. Ultimately I stepped up and was the first one to hit the gap. I remember sailing over the road and looking down, thinking “oh my god I’m going to make it” even though I was going to land on my face on the other side. I sailed over the road four or five times that day and soon after Dave Bosch and Nick Marker had done it too and we were all extatic. Unfortunately for us, the police and forest rangers had spotted us and we got in a bit of trouble. They made us tear down the jump, but we knew we would go up again, and next time we would bring our video camera! It turns out that without the footage, nobody back home would believe us about the gap. Even Brandon Bosch (Dave’s older brother) called us liars and then proceeded to go to the same spot (with his camera) and gap the road himself trying to beat us to the glory. Ironically Brandon almost died trying to make the gap, he shot over the road off balance and was flailing his arms “rolling up the windows style” and landed right on his head. You can see this footage near the end of the movie in the credits. The second time we went up I brought our camera and I took it one step further by hucking a backflip over the road. It took me six tries to get the back flip over Rainbow Curve on video (one of our friends named Shane S. had gotten upset on our way up that day and threw the camera in the snow, so it was having trouble working consistently). Ultimately, we got the shot and it went into Hidden, which is the video you see posted here. These days of snowboarding took place between 99’ and 2001 while we were 14 to 17 years old. We shopped the Hidden video around and were offered a sponsorship deal by Zumiez in the Fort Collins Foothills Fashion mall. It was one of the greatest accomplishments any of us had. The Ruff Ryder crew, Dave Bosch, Max Pettijohn, and me Court, was such an honor and just so cool it still brings us together. I love you guys and the time we spent is one of my fondest memories. Props to Jeff, Si, Chris, Brad, Peter Shockley, Max, Dave, and both Shanes. Court-You recognized and rejoiced in the joys of childhood at an early age. An American poet,John Greenleaf Whitter didn't realize these joys until old age set in on him and he nostaglia looked back. Barefoot boy, with cheeks of tan! Have you ever played fish ball? Born in Colorado Springs and raised in Loveland - Currently living the dream in California.